What Type of Sewer Pipe Does Your Home Have? Few, if any, homeowners ever elect to dig up their yard to take a look at their sewer pipe. Pipe assessment is never an elective activity; it's usually forced upon you when the toilets refuse to flush and wastewater comes up instead of going down. Digging up and replacing your sewer pipe is that dreaded activity that destroys landscaping, costs a bundle, and accomplishes nothing other than letting you return to life as usual. But understanding what kind of sewer pipe you have helps to minimize the pain a bit since you will know whether you can continue with the same pipe or switch to a different pipe. Often, the type of sewer pipe running through your yard corresponds with the age of your house. In older properties built before the 1950s, you might find clay pipe, cast-iron pipe, or a fiber conduit pipe called Orangeburg. Clay and cast-iron are older types of sewer piping and can remain in the ground as long as they are still moving waste with no leaks. Orangeburg sewer pipe is worth replacing if you have the ground opened up, even if the Orangeburg appears to be in good shape. Even older homes might have newer plastic sewer pipe. As the years wear on, sewer systems deteriorate. When replacement happens, it typically will happen with plastic pipe. If you're wary about the condition of your sewer pipe, you can always order a non-invasive video pipe inspection. Homes built from the 1970s onward tend to have plastic sewer pipe. In some rare instances, you may find older cast-iron or clay sewer lines at a new house. The new house (and even some remodeled houses) will often have new pipe installed within the house envelope itself and extending a few feet into the yard. The yard area is where the old sewer pipe will start up again and continue all the way to the city sewer main. 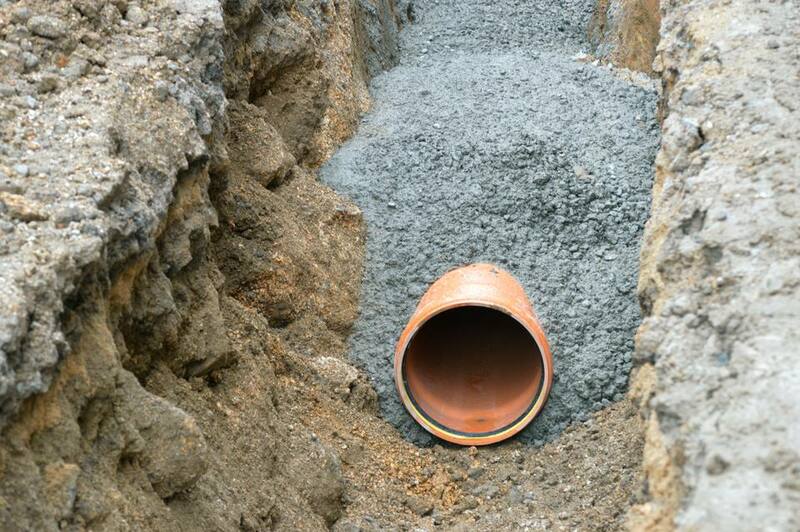 In most new sewer line installations, you may find yourself being steered in the direction of PVC or ABS plastic pipe over clay and cast-iron. While the plastic pipe is undoubtedly easier to work with, clay and iron have strong points, such as longer lifespans and strength (for the iron). Plastic sewer pipe for underground installations is available in both ABS and PVC. Both types of pipe have smooth interiors for excellent carrying capacity of solid waste matter. The smooth exteriors also help resist root anchorage. Plastic sewer pipe is usually the material of choice for do-it-yourselfers since it is lightweight, easy to cut, inexpensive, and available at all home centers. As an added benefit, plastic pipe can be tied into cast-iron and clay pipe. Cast-iron sewer pipe, like clay pipe, is associated with older homes, yet it is still installed today. One of the best things about cast iron pipe is that it is incredibly strong. A 4-inch diameter sewer pipe can withstand well over two tons of pressure per linear foot. By contrast, clay, ABS, and PVC pipe are all subject to breakage. Cast-iron sewer pipe is heavy and difficult for a do-it-yourselfer to cut. To cut a cast-iron pipe in the ground, you need a soil pipe cutter, a specialty tool that can be rented from supply houses for a small fee. Cast iron pipe is non-flammable. This is not an issue for below-ground installations; but should you decide to continue the cast-iron into the house, you can feel secure knowing that cast-iron pipe will not melt in a fire. Vitrified clay sewer pipe is still laid today, though as a do-it-yourself homeowner you probably will not want to choose this for your sewer line replacement. Clay pipe is heavy and tricky to cut. Often, your choice of sewer pipe is dictated by what your home improvement store has on hand, and none of the major retailers carry clay pipe. While clay pipe may seem archaic, it is a viable form of sewer pipe. One great benefit of clay pipe over plastic pipe is that it is inert, making it highly resistant to chemical degradation. Because clay sewer pipe has a porous surface, it tends to attract tree roots. Roots that impinge on clay pipe may eventually cause the pipe to crack. Flawless, pristine Orangeburg sewer pipe is not something you often see. Typically, you find Orangeburg sewer pipe in a collapsed state after you dig up your malfunctioning sewer line. Orangeburg, a fiber conduit pipe, was manufactured from wood fibers bound with a special water-resistant adhesive, then impregnated with liquefied coal tar pitch. Orangeburg was favored by many plumbers of the time because it was lightweight to carry and easy to cut with a regular wood saw. Fiber conduit pipe that was properly bedded in sand and pea gravel to reduce stress will last longer than poorly prepared installations. Most Orangeburg has a lifespan of no more than 50 years.